At the peak of my running fitness, I could easily head out and run a half-marathon without much thought. My PR was just under 1:55 and it seemed every time I ran the distance, I could chip away at my previous PR. I went through a stretch where almost every time I ran the distance, I would PR. I haven't taken the half-marathon distance seriously in almost five years. It's crazy because it doesn't feel that long. When I got injured in 2013, I set my sights on bouncing back to the full marathon. See, I was happy with my 13.1 race time but I was itching to get a sub-4 marathon under my belt. I think my push to get back to the full marathon distance is the reason it took me so long to get back to running and why I kept getting hurt. 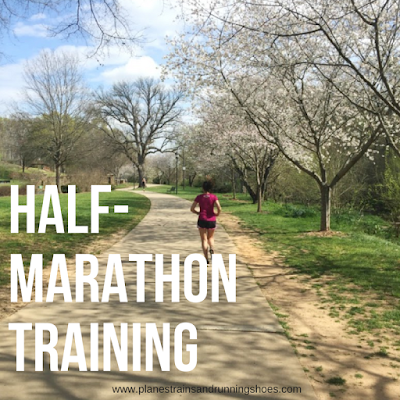 I used to run 2 or 3 half-marathons every time I trained for a full but for a number of reasons, I haven't run any 13.1 races while training for either of my last two full marathons. This year, I set my sights on a spring marathon and, for a number of reasons, that didn't happen. I haven't run anything since Disney this year (which feels like a lifetime ago) but I'm itching to run a strong race. I know it might not be smart to jump into training for a half when I've run so infrequently this year but I feel like I need that distance to stay focused. I hate the 10k distance and the 5k is too short. I need something to train for that will challenge me and make me feel like I'm back to running. I've decided on the Annapolis Half-Marathon. It's a course I've never run which is fun, it's close to home, and you get oysters at the finish line. What could be better? Last week was the first week I consistently ran in a long time. I did two 3-mile runs and two 2-mile runs. I was hoping to get more cross-training in but honestly, I was really tired last week and didn't make it a priority. I definitely want that to change moving forward so my plan for this week is 4 training runs, and one class each of spin, barre, and yoga. We'll see how it goes! I'm excited to actually be training for something. It's definitely motivating me to get out the door and run when I'm tempted to lay under a blanket with a book in the mornings!